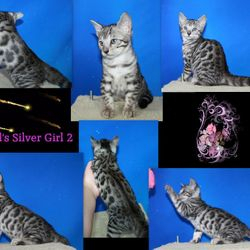 "Wild At Heart But Tamed With Love"
Occasionally we have available kittens or adults that are not listed on our website. Feel free to contact us and let us know what you are looking for and we will provide you with more information. 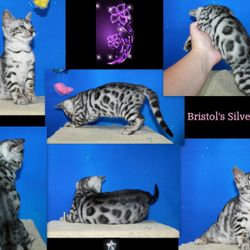 Good Bengals are NOT inexpensive, you generally get what you pay for! 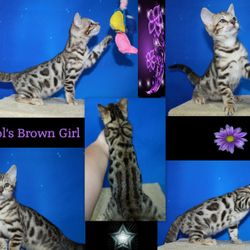 It is true, you can find Bengal kittens priced very low, but in most cases, these will not have the bright colors and vivid markings that you see on Bengals pictured on websites and in magazines. Once you have decided on a kitten, a non-refundable holding fee is required to hold the kitten until it is ready to go home. 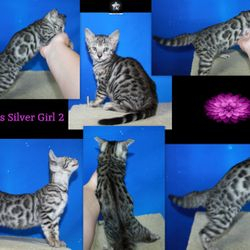 There is a lot of personal involvement and expense involved in raising quality kittens, more than most people realize. 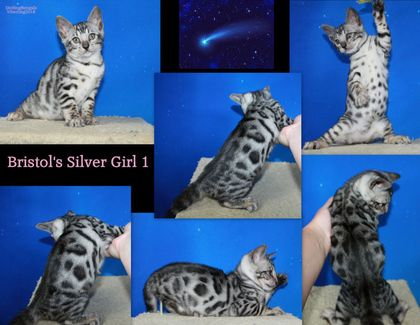 Our kittens are evaluated and priced accordingly. 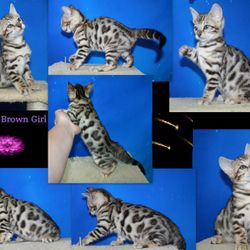 Those that meet the Bengal standard, have the best markings, pattern, coloration, and conformation are our top quality kittens and therefore are the most expensive. 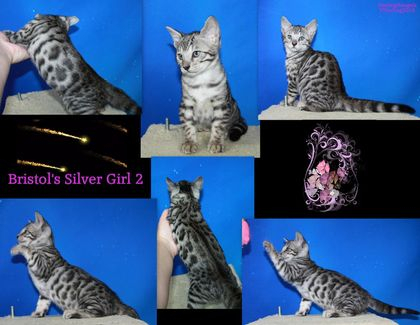 Kittens go through many stages as they develop, so we're continually re-evaluating them as they get older. 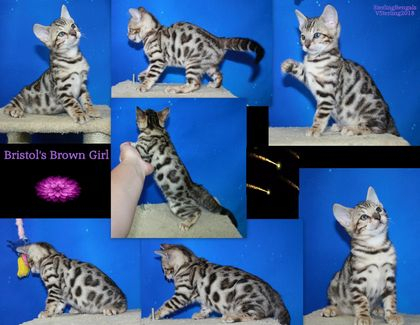 We can generally tell at birth what to expect from a kitten and we price them accordingly. But they do sometimes surprise us by getting better than we expected or not as nice as we'd like. So we do reserve the right to re-assess them as they develop and price them accordingly. But once someone has placed a deposit on a kitten, the price is LOCKED in and will not increase. I do realize everyone loves to see pictures of their new bundle of joy, but please realize how difficult it is to get good pictures of active kittens! It takes a good deal of time waiting for the perfect pose and lively kittens have other ideas than getting their picture taken! We try to update the pictures on our website at least every few weeks but sometimes it is hard to do that. And when they are after five weeks of age they are starting to go through the fuzzy stage. You can read about the fuzzies on my information page. When you are picking your new kitten up from us we can let him or her go at 12 to 16 weeks of age. At this time they are eating well on their own, using the litter box and have vaccinations started. Our kittens are guaranteed healthy on arrival but we do require that you have your new kitten checked by your vet within 72 hours of arrival. 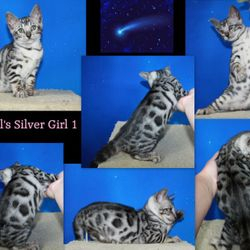 Your new kitten will come with a written health guarantee and a pet or breeder contract. ALL pet kittens WILL be altered before leaving our cattery. Please feel free to contact us with any questions that you may have and I hope that you enjoy your visit through our website. Take A Look By Clicking On The Link Below. Many Amazing Shapes And Sizes, Every Pampered Pet Deserves The Best! 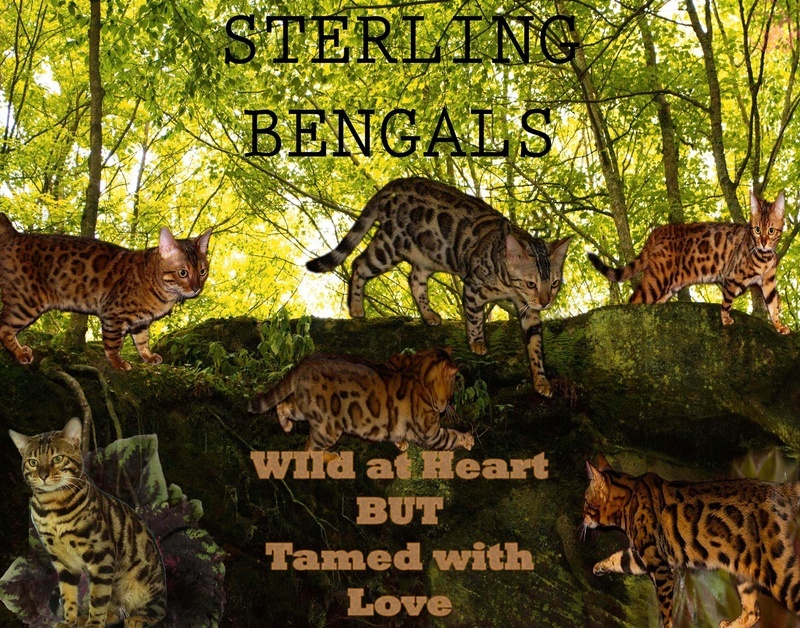 Thank you for contacting us about one of our precious Bengals. We will get back to you as soon as possible.